The Second Parlor was an all-purpose gathering and socializing space for family and visitors (the Front Parlor being used only on the most important of occasions; its fireplace was of Carrara marble). 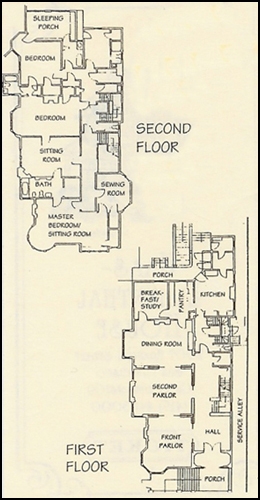 The plan at left shows the layout of the house. In the Second Parlor, the docent presented the fireplace as “Numidian marble” from “Alexandria”. Numidia, being at the opposite end of North Africa, has no association with Egyptian Alexandria, which in any case had no nearby marble sources. Numidian marble usually means coming from one of two quarry zones: Kristel or Kleber in Algeria (Bréche Sanguine); or Chimtou in Tunisia (Marmor Numidicum). An important dark red stone does come from Egypt: “Red Porphyry” from Gebel Abu-Dukhan in northern Egypt, though it is not marble. A mystery, then. Which of these three possible sources could have served as the origin of the stone, if indeed it originated in North Africa? And by what means did it get to San Francisco in the 1880s? Quarries for red ‘marble’ in North Africa: Kristel/Kleber, Algeria (green); Chimtou, Tunisia (red); and Gebel Abu-Dukhan, Egypt (blue). The map above shows the location of the potential sources. To zoom in on the quarries themselves, see this Google Map. Here’s the fireplace (close-up view). It is predominantly a deep red, though it has yellow-gold and darker-red brecciation and striation. While marble identification is notoriously difficult on visual inspection alone, in part because of great variation from one part of a formation to another, it seemed a fun exercise to compare the strengths and weaknesses of the three candidates (Kristel/Kleber, Chimtou, Gebel Abu-Dukhan), going from west to east. 1. Kristel/Kleber: “Bréche Sanguine“. Quarries at Montagne Grise, northeast of Oran (which was the shipping point for its stone exports). These quarries were in wide operation in the late 19th and early 20th century; the British Geological Survey’s GeoScenic Databank cites their presence in many British buildings of that period. Interestingly, the entry also says this: “Breche Sanguine is frequently sent to the United States where it is used for decorative purposes. An instance may be seen in the Carnegie Library, Pittsburg, which was built in 1904, the columns, pilasters, and wainscoting in the smoking-room being composed of it.” Bréche Sanguine is a likely suspect, then. Sample P576018. Breche Sanguine. Kleber quarries, Algeria. GeoScenic. Sample P576028. Breche Sanguine. Kleber quarries, Algeria. GeoScenic. 2. Chimtou: “Giallo Antico” or “Marmor Numidicum“. 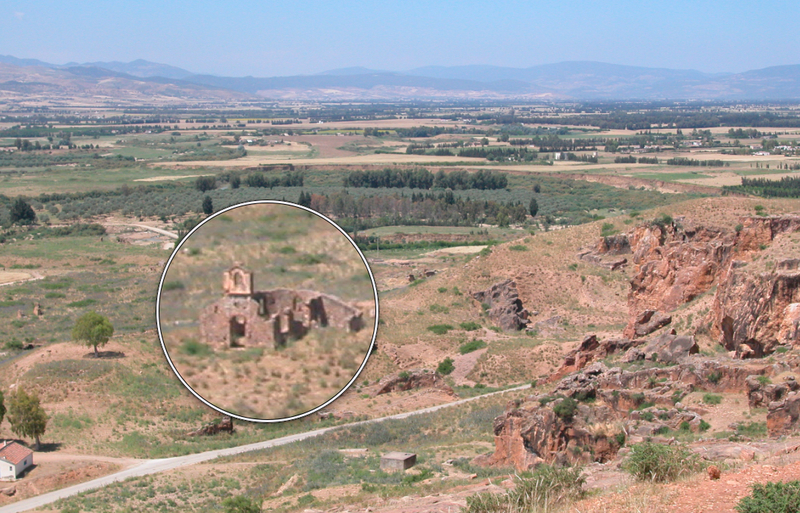 These quarries were worked from the 2nd c. BC to the 5th c. AD, and the material shipped via the adjacent Medjerda River down to the sea at Utica. They are principally known for their golden-hued mottled or striated appearance, though the spectrum of color at the quarries varies from nearly white to dark red. This is shown in a display at the excellent local museum (rarely visited, but worth seeing), built by the Deutsches Archäologisches Institut, which pursued research there for some 30 years. (Though one of the most thorough site overviews is the French Wikipedia page.) Additional samples of marmor Numidicum can be viewed in the Corsi Collection of Decorative Stones at Oxford. Faustino Corsi did the foundational scholarship about ancient marble samples, though none of the three quarries that are best candidates for this fireplace were being worked while he was building his collection. M. Lepidus Q. Catuli in consulatu conlega primus omnium limina ex Numidico marmore in domo posuit magna reprensione. is fuit consul anno urbis DCLXXVI. hoc primum invecti Numidici marmoris vestigium invenio, non in columnis tamen crustisve, ut supra Carystii, sed in massa ac vilissimo liminum usu. M. Lepidus, a colleague of Quintus Catulus in the consulship, first of anyone put thresholds of Numidian marble in his house, to great opprobrium. He was consul in the 676th year (from the foundation) of the city. I find this to be the first instance of Numidian marble–but not in columns or revetment, as (mentioned) above with that of Carystos— but in block-form, and for the so very ‘cheap’ application of thresholds. Concerning Lepidus’ faux pas, did he not know that putting such precious marble in a position to be tread upon was gauche? Or did he know, and as a politician looking to build his leadership with the populares faction in Rome, was he looking to undercut the knowledge and authority of the optimates by subverting one of the ways by which they claimed power: control, and knowledge of, exotica? Imperial/colonial control of rare commodities in North Africa was reasserted in the French invasion of Algeria in 1830 and Tunisia in 1881 (as well as the interventions of Great Britain that led to occupying Egypt in 1882). European governance led to commercial concessions, and by the end of the century giallo antico was again being exported worldwide. An Italian company worked the mountain, and the ruins of a church for its workers is still present at the site. However, such production probably came too late for this marble to have been available during the fashioning of the fireplace in question (the Haas-Lilienthal House was built in 1886). 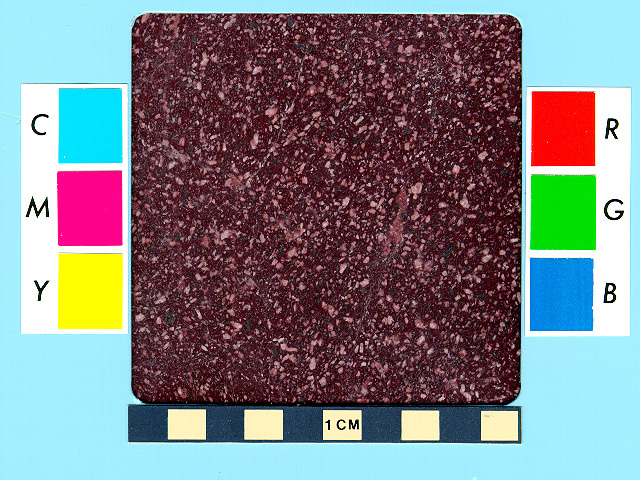 What about the red porphyry from Egypt? 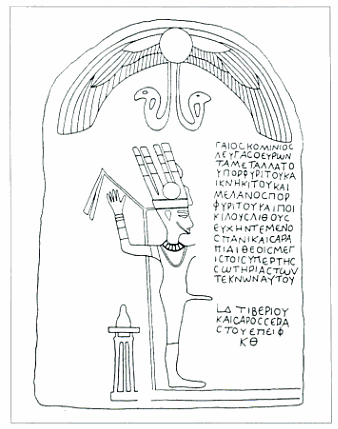 The original drawing and publication of the Gaius Cominius Leugas inscription from Mons Porphyrites, reproduced here by permission from W. Van Rengen, who published it in “A new Paneion at Mons Porphyrites,” Chronique d’Égypte 70 (1995), 240-5. Later reproductions and discussion can also be found in J.C. Fant, “Augustus and the City of Marble,” Asmosia IV (1995), Fig. 1, p. 279, and in I. Shaw, Exploring Ancient Egypt (Oxford 2003) 260. “Caius Cominius Leugas, who discovered the quarries of the porphyry stone and knekites and black porphyry and also (found) multi-coloured stones, dedicated a sanctuary to Pan and Serapis, very great gods, for the well-being of his children. The 4th year of Tiberius Caesar Augustus Epeiph the 29th.” (after W. Van Rengen, “A new Paneion at Mons Porphyrites,” Chronique d’Égypte 70  242-3). Porphyry was extracted here into the early 5th c. AD, serving imperial use exclusively, such as for the famous tetrarchs statue once in Constantinople and now (as spolium) adorning St. Mark’s in Venice, or the sarcophagus of Constantina in Rome. The site was rediscovered in 1822 by James Burton, and received its first substantial publication ten years later by John Wilkinson (ref. Steve Sidebotham’s book). 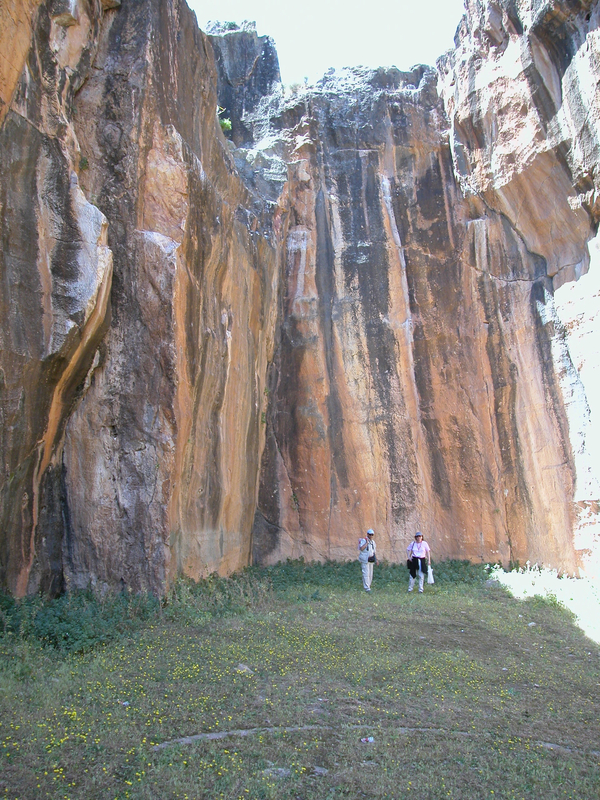 Four of the ancient quarry complexes produce a red-purple tinted stone. In the Italian literature this stone is often known as “porfido rosso antico,” drawing upon (once again) Pliny the Elder, who in Historia Naturalis 36.11 briefly says: “rubet porphyrites in eadem Aegypto,” or “also in Egypt, Porphyry has a red color.” The locations and geology of the stone sources are documented in Ancient Egyptian Hardstone Quarries, which provides the photographic sample below (although the term ‘rubet porphyrites‘ is a misnomer, since ‘rubet‘ is a verb, not an adjective; in fact, it means “to blush”). It is obvious from the porphyry sample that this is not the stone from the fireplace. Gebel Abu-Dukhan, in any case, has not seen any substantial modern production. It is also unlikely (at least so far, there’s no evidence) that the Chimtou quarries were exporting marble slabs before 1886 (and the red color of the fireplace is on the rare end of that quarry’s spectrum anyway). That leaves the “Bréche Sanguine” from Kleber in Algeria as the strongest candidate in color, nature, and circumstance. 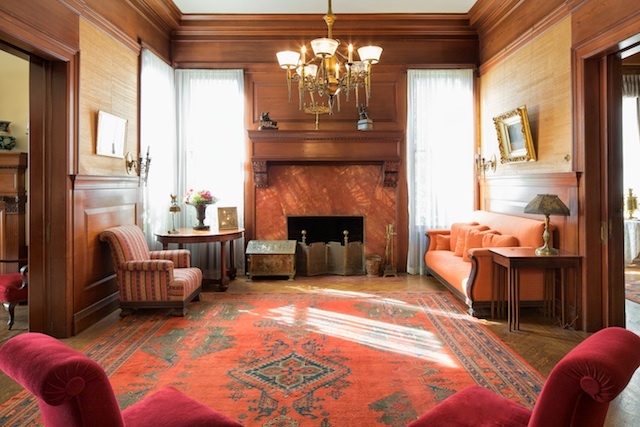 But why would such an exotic and richly colorful marble be chosen for the Second Parlor in the Haas-Lilienthal House, while white marble (from the much more widely-known Carrara quarries) was reserved for the high-purpose Front Parlor? Jackson & Co. were protesting a duty they had paid for ‘marble in block’, for imports they said were actually ‘breccia’, not ‘marble’. (In the tariff act of 1897, breccia had been listed as a duty-free import). In the rationale for upholding an exemption for breccia, three kinds of affected stone are given as examples, including ‘breche sanguine’. The argument over duties continued until 22 May, 1911, when the U.S. Court of Customs Appeals ruled that breccia and marble should in fact be subject to equal tariff. In that decision, mention is made of previous tariff acts that specified breccia as duty-free, including one in 1883. That same 1883 tariff act taxed block marble at 65 cents/cubic foot; ‘sawed’ or mosaic marble, such as that used in the fireplace slabs, was levied at $1.10/cubic foot. While it might seem that sawn marble was subject to harsher tariff, American marble companies thought otherwise. They were struggling to compete with Italian producers of Carrara. In an appeal to the House Finance Committee on 29 Dec, 1888 (which showed the math), a group of domestic marble companies asked for cheaper rate (of 40 cents) on block marble that they could saw themselves, and then sell stateside at a competitive price. Their plea was ignored. All this legal categorization shows that the red ‘breccia’ fireplace slabs were considered ‘cheaper’ material, and not ‘true’ marble. They had the look, but not the cost. For the aspirational upper-middle-class Haas family, Bréche Sanguine from Algeria was a sensible, even savvy, choice. 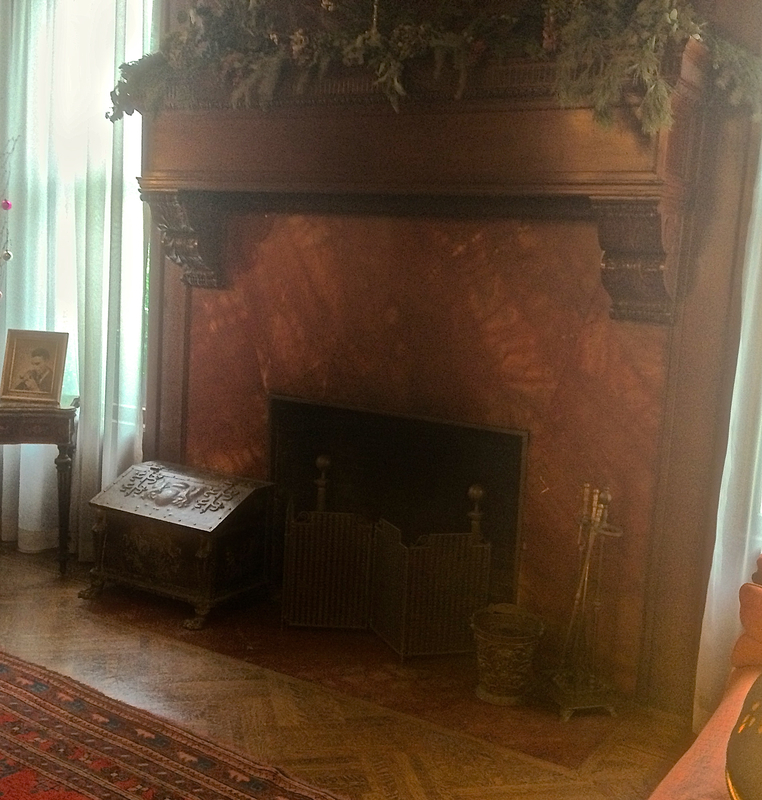 The red fireplace turned out to be just one curious instance of stones brought from one Barbary coast to the other. The second turned up in the Botanical Garden of Golden Gate Park. Walking through the Succulent Garden near the southwest corner, we began to notice a number of carved stones built into the terracing and along the walkways: bits of architrave or lintels; dressed limestone blocks (see a panorama). Our first thought was that they might be spolia (recall the tetrarchal spolium above) from classicizing buildings destroyed by the Great Earthquake/Fire. After all, architectural features from several buildings damaged by that disaster have survived or been reincorporated elsewhere in the city (SF Architectural Heritage News, Fall 2011; see pp. 12-13). It turns out that the truth was much more interesting. Arriving at the east end of the gardens in front of the Library (see map), we encountered a small plaque set in front of a wall and a much more extensive set of architectural fragments. The plaque explains that these stones, and others set in walls around the Fragrance Garden and elsewhere, belonged to a 12th-century Cistercian monastery, Santa María de Óvila, from Guadalajara in central Spain. Sections of this complex were purchased, dismantled, and shipped by the one-and-only William Randolph Hearst and moved at great expense in 1930-1 (necessitating new roadways, railway, and 11 cargo ships) to the Haslett warehouse on the San Francisco docks, where the crates stayed for a decade, building up storage fees as Hearst’s fortunes and plans wavered. A bargain was struck between the City (who paid the storage fees) and Hearst (who gave over the stones), on the condition that they be used to construct museum buildings next to the de Young Museum in Golden Gate Park. But construction funding was not forthcoming, so the crates of stone languished, suffering from neglect and even several fires, as various factions argued over what to do (or not do) with them. Firemen putting out the burning crates in 1941, soon after they had arrived in Golden Gate Park. From J. Leibman at SF City Guides. Sacred Stones (visit the links in the ‘History’ tab), which documents the journey of the stones from Spain to San Francisco. It also describes their current reconstruction (the bulk of the collection, anyway) for the Chapter House of the Abbey of New Clairvaux in the Sacramento Valley. It includes the account of a young monk, Thomas X. Davis, who noticed the crated stone in Golden Gate Park on his way to New Clairvaux on Sept. 15, 1955, who could not get the stones out of his head, and who led the drive to have them reassembled at the Abbey. Margaret Burke’s 1982 article about constructing plans and models to build with the stones once more. A Wikipedia page for Santa María de Óvila, with extensive notes and illustrations. Jack Leibman’s piece for San Francisco City Guides. Suffice it to say that while some of the stones have been used for walls and terracing at the Arboretum, and some have been lost or destroyed, most have now been placed back into medieval shape in Vina, California. Some of the funding even came from another ancient technology: brewing. The abbey has a set of Trappist ales called ‘Ovila’. Now did the original 12th-c. Cistercian monastery in Guadalajara incorporate stones from any classical sites, leading to actual Roman spolia brought to California? Alas, it does not seem so; none are quite close enough. Even the fantastic Visigothic city of Recópolis, some 60 km. away (and currently being excavated), was built from scratch. Might as well keep looking, though, in order to feed the addiction of inquiry that emerges from spotting curious pieces of stone. I sent this story to the Haas-Lilienthal docents as an attempt to ‘ground-truth’ it. Here’s what’s new in their responses (received yesterday), with brief comments. 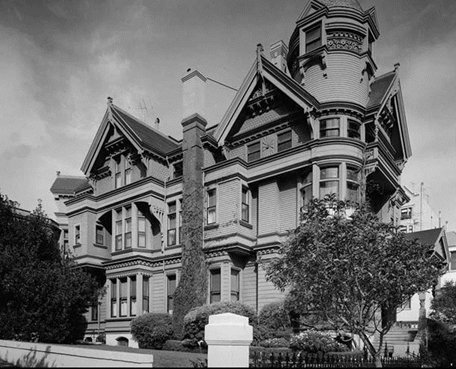 Thanks to Barbara, Carlo, Genevieve, and all the others at the Haas-Lilienthal House and San Francisco Heritage for their devotion to investigating, preserving, and sharing our cultural patrimony. Wow. I am one of the docents at the Haas Lilienthal house and I found your essay on the marble in the second parlor very enlightening. I usually say it is red numidian from North Africa, not Alexandria, but now I have even more information to offer anyone who is truly interested. By the way, I was informed by someone that this same stone appears in the Marble House, in Newport, Rhode Island. Thanks so much for your comment. We very much enjoyed our visit. Thanks for the tip about the Marble House!